There were about 50 Steelcase Please chairs to re-cover with new fabric. Over time the original fabric had worn away and the padding was starting to come through! The orginal fabric was a mix of black on the top of the chair back and seat pad, with a yellow fabric in the middle section of the chair back. The chairs also needed new foam or padding, which was easy to do. The fabric chosen was a group 2 fabric and made by camira fabrics. There are lots of fabrics to choose from and whatever colour you are looking for, the fabric manufacturers will have it in their ranges. Reupholstering the chairs were very easy and it allowed the client to refurbish the chairs at a fraction of the cost of buying new, which was great as it meant that the chairs could continued to be used. 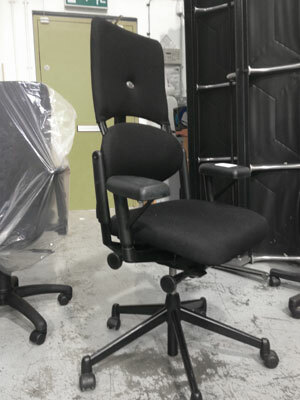 This entry was posted in Chair Repair & Reupholstery and tagged re-cover steelcase please chairs, reupholster, steelcase please chairs on 20 Apr 2015 by admin.